This Study Is Titled: “The Effects Of Population Growth On Agricultural Productivity In Nigeria Between 2000-2016”. It Is Aimed To Investigate The Effects Of Population Growth On Agricultural Productivity Using Annual data for year 2000-2013, projected to 2016. The data was obtained from Central Bank of Nigeria Statistical Bulletin vol. 24, National Bureau of Statistics annual Data Statistics. The study used regression analysis with the aid of Statistical Package of Social sciences (SPSS).The Agricultural Production Output (AGP) which is the dependent variable serves as proxy of Agricultural Productivity,while Total Population (POP), Commercial Bank Credits (CRE) and Government Expenditure on Agriculture (GEA) serve as the independent variables. The there is a positive relationship between AGP and POP, CRE and GEA where the COD (r2) = 94%, 78.2%, and 67.2% respectively. That the as the population is growing, food production also grow at a diminishing marginal level. 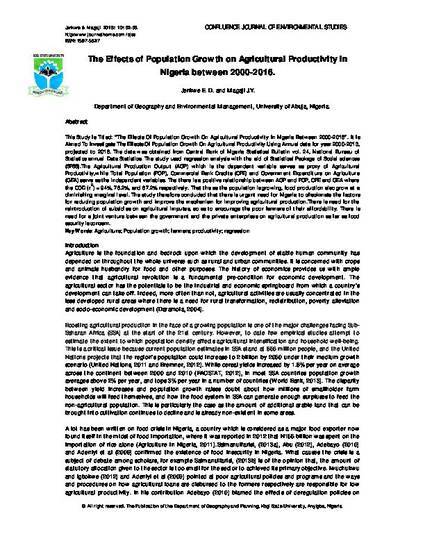 The study therefore concluded that there is urgent need for Nigeria to checkmate the factors for reducing population growth and improve the mechanism for improving agricultural production.There is need for the reintroduction of subsidies on agricultural imputes, so as to encourage the poor farmers of their affordability. There is need for a joint venture between the government and the private enterprises on agricultural production as far as food security is concern.